It seems to me, that in every library kids section it is not so quiet. 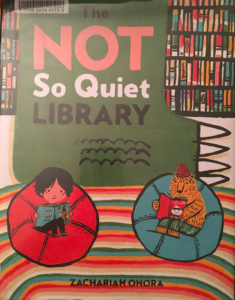 The Not So Quiet Library by Zachariah Ohora has a bigger problem than noisy kids though… it has a noisy MONSTER! With FIVE heads! And they think they’re in a restaurant! But books are not food, they don’t taste good, no matter how many sprinkles you put on them. Bob, Seymour, Winston, Pat and Chuck are upset! ROAR! What ever can be done to save Oskar, and Theodore, and the books, and the quiet, and the library? SO funny, SO good, SO cute! 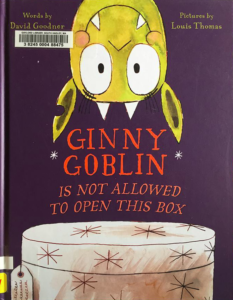 Ginny Goblin is Not Allowed to Open This Box by David Goodner, illustrated by Louis Thomas, is super funny and cute. First of all, I want to open the book as badly as Ginny wants to open the box! Look how adorable Ginny is! And the all the trouble she goes to to open the box! Hahaha. Waiting patiently is not my thing either. 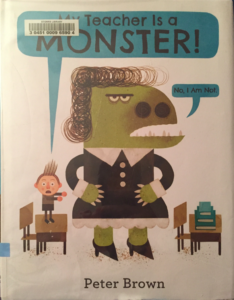 This is a great, silly, sweet book:) And Goblin’s count as monsters, right? 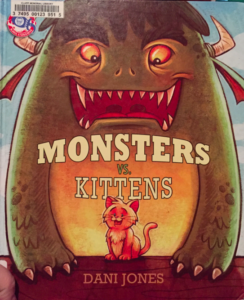 Monsters vs. Kittens by Dani Jones. 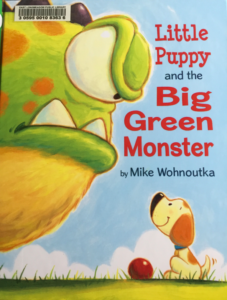 Clearly, Monsters and Kittens are being compared in this book. The pros and cons of a monster’s features weighed against the same for the kittens. The monsters are perfectly monstrous but SO adorable. I think I could cuddle them as much as the kittens! I’m pretty sure monsters win:) But I am biased. Monster season is my favorite. 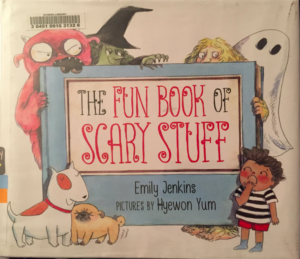 The Fun Book of Scary Stuff by Emily Jenkins, illustrated by Hyewon Yum, is a blast! I LOVE the sarcastic dog. Yes, sarcastic (and actually sometimes quite sensible) dog. SO funny. With a trusty buddy by your side, you always have someone hug when there is a monster. There are some scary things in here for sure, but there is always a reassuring dog comment:) uunnttiill… the darkness comes! That is REALLY scary! 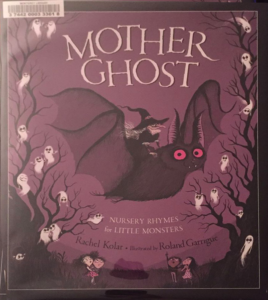 Mother Ghost Nursery Rhymes for Little Monsters by Rachel Kolar, illustrated by Roland Garrigue. Mostly ghostly, sweet and scary. Found a loop-hole to include ghosts and jack-o-lanterns in the list because little monsters will enjoy reading these. Fun little rhymes, with the beat you remember but are all about the spooky season. I love the happy little ghosts and chubby owls! 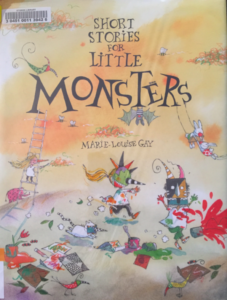 Short Stories for Little Monsters by Marie-Louise Gay made me laugh! Short little trips into funny-land with every turn of the page. What do trees talk about? What games to cats play? Is your brother lying about the shark in the water? Can your mother see through the ceiling? Hilarious! The colorful illustrations are loose and playful. Just like the stories:) The least scary spooky of the list, but just right for little, little monsters.